It's not often that you hear good news from Zimbabwe, and even rarer that you hear good news in conservation. So this blog might come as a surprise to some because for once it's not bad news! If you came along to the fundraiser I did with the SAVE Foundation in Sydney in August last year, linked to the launch of my latest book "Planet Elephant", you helped raise funds for the intensive anti-poaching efforts being led by specialists Bryce and Lara Clemence of Aggressive Tracking Specialists (ATS) in the Save Valley Conservancy, Zimbabwe. On the trip we saw over 100 elephants, 13 lions, 3 leopards, 12 wild dogs, baby hyenas (pretty much baby everything) a cheetah and a truck load more! I became great friends with everyone on the trip and we plan to stay in touch. 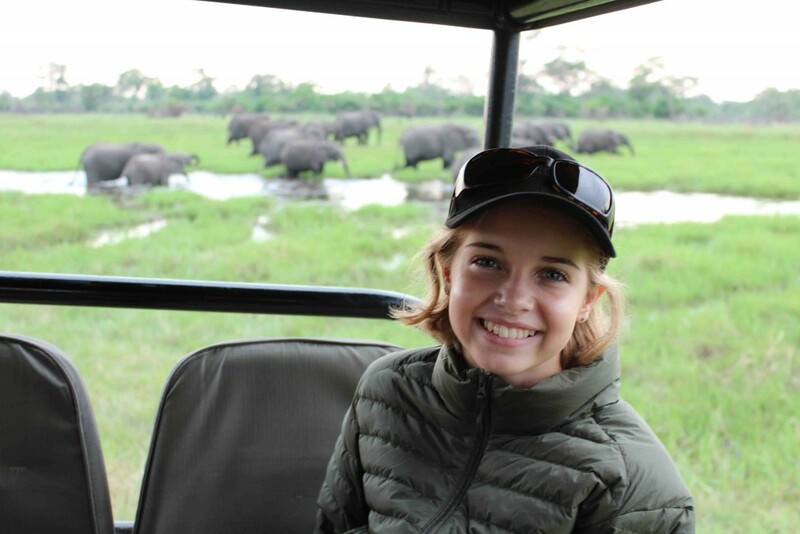 I also became great friends with the staff at all three camps and I even got to make my own traditional bracelet and was crowned queen of the Okavango delta. We got to go on the mokoros, a traditional boat pushed by a pole, where we saw 3 sitatunga (a really hard to find aquatic antelope). We also saw 6 lions in a place that hadn't seen lions in 3 years! Going on the safari trucks every morning was so exciting because you would never know what that day might bring, but each day was spectacular in its own way. This is THE year to go to Kenya, with prices being so much lower than usual due to the masses being scared off due to ebola in west Africa (a long, long way from Kenya - you're closer to the ebola countries in London than you are in Nairobi, just to put it in perspective). I only have 3-4 spots left on this amazing journey that makes a difference in the world famous Maasai Mara during the time of the Great Wildebeest Migration, led personally by me. Not to mention a private viewing at Daphne Sheldick's elephant and rhino orphanage in Nairobi on the first day - utterly unforgettable! If you're ever going to do it, this is a great way to go, travelling with a small group of 10, plus you've got me there for everything you every wanted to know from a zoologist's perspective, making friends for life with like-minded folks. Ask anyone who went on my last safari in Botswana - there's a special kind of magic on a Matson & Ridley Safari because of the kind of people who join me.... Grab your spot now! For full details on my Kenyan safari click here and contact me for an itinerary. I'm finalising numbers now so don't wait! Calling all Africaphiles in SE Queensland! Being based in my old haunt, South East Queensland, for the next month or so, it seems too good an opportunity to miss to get together with fellow Africa-lovers in this part of the world. Annie from Annie's Books on Perigian, a huge Africaphile herself, is hosting a night of Africa with yours truly on Wednesday 21st January at the Perigian Beach Community House at the Sunshine Coast (near Noosa). I'll be showing the Let Elephants Be Elephants documentary, which aired across Asia on National Geographic channel last year, but hasn't yet been shown in Australia, and of course, talking about Africa, elephants and all things safari-esque! Only $15/person and includes wine and cheese - what a deal! For further details check out Annie's Books on Perigian website by clicking here. Look forward to seeing you there SEQ! If you have a strong community of Africaphiles around you who've all got 'the Africa bug' real bad and you'd like me to join you for an evening where you live, drop me a line through my website. There's never been a better time to go to Kenya, as while tourist numbers are down you'll get better deals to travel there than ever before. Kenya is EBOLA FREE (the ebola zone in west Africa is closer to London than it is to Nairobi) and the terrorist attacks that have been highlighted in the news, including the one at Westgate shopping centre last year, are nowhere near the safari areas. Those in the know are making the most of the great deals while they last! There are few places in the world where you can watch wild animals at very close range without them being affected by your presence. Botswana's Okavango Delta is one of these rare places and if you've never seen it, believe me, it's worth the visit. Don't worry, elephants don't get ebola. Well not as far as I'm aware! But that doesn't mean they won't be severely affected by the disease in other ways. Indeed, elephant populations will very likely be impacted indirectly and I think we should be very concerned about what's happening at the moment. Next week, conservationists from all around the world will gather in Sydney for the World Parks Congress, including my very own co-founder of Let Elephants Be Elephants, Nadya Hutagalung, who will be speaking at the world leaders dialogues with the head of CITES, Director General of WWF, Ministers of Environment of Australia and South Africa, and several other esteemed influencers. They'll be discussing the conservation of protected areas around the world. Meanwhile, a crisis is unfolding in Africa and in this case it's something that the general public has a big role to play in solving. I've always wanted to check out the Philippines, and living in Asia for the last couple of years finally afforded us the opportunity to do a bit of exploring. Ever heard of Palawan? It's a series of islands to the west of the main Philippines islands, quite off the beaten track and home of the famous Underground River, a UNESCO World Heritage site that is considered to be the world's longest underground river. Conde Naste magazine recently awarded Palawan the best island award as part of their 2014 Travel Awards - and here's why.